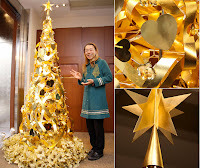 Ginza Tanaka a Tokyo famous jeweler once again made an awesome piece of art by making this pure gold Christmas tree which is worth for $2 Million or approximately 1,5 million Euros. It's not the first time for ginza tanaka to made a luxury stuff made from gold. before this we have also posted about the most luxurious woman handbags. one of them was made by Ginza tanaka. So how about this golden Christmas tree? I wonder if someone would place it for this years christmas. The pure gold tree which weighs 12 kg and is about 2,4 meters high, is adorned with golden plates and about 60 heart-shaped ornaments (see also the most expensive Christmas ornament), decorated with ribbons. 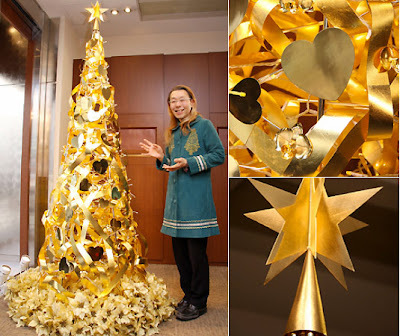 The precious Christmas tree is the Japanese jeweller’s most expensive creation so far. before this there's several other luxury stuff made by ginza tanaka such as a 24 karat gold horse for Japan’s newborn prince, as well as a pure gold tree that cost 850 000 $ (about 635 000 €) in 2006. 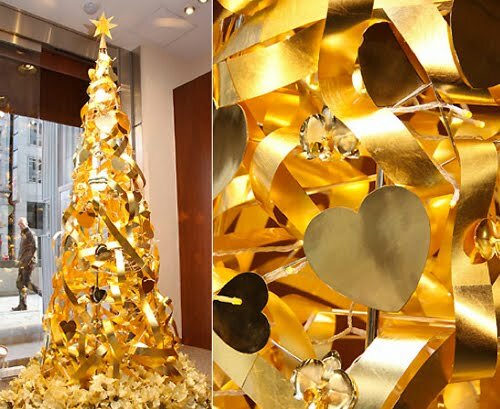 Even this Golden Christmas tree from Ginza tanaka looks so shiny but it couldn't beat this $11 Million Christmas Tree which is placed on the lobby of the 7 star hotels in united arab emirates last year. Here's the images of the Pure gold Christmas tree by Ginza Tanaka.